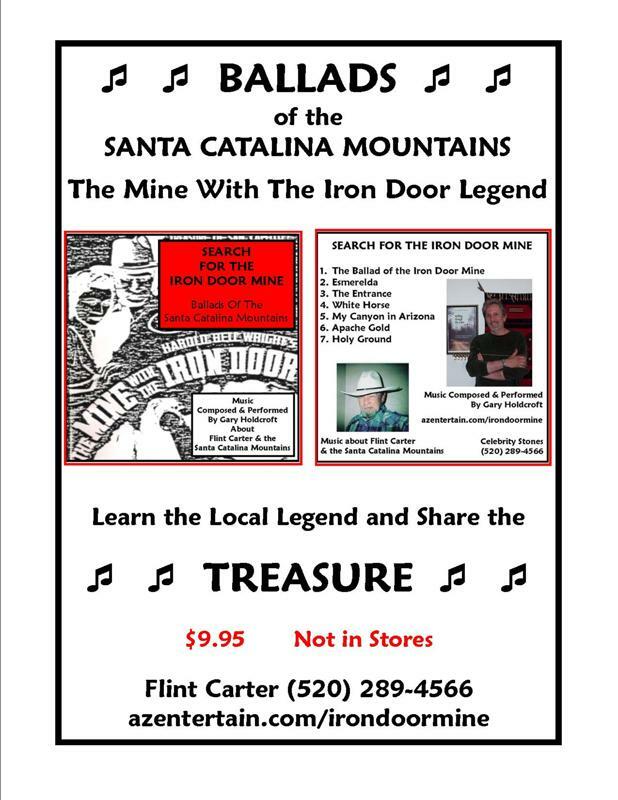 CD of "Search for the Iron Door"
Listen to seven songs and ballads on CD about the Iron Door Mine, the Santa Catalina Mountains and Flint Carter. $9.95. Call 520-289-4566 for more information and to purchase directly. Mention the Iron Door web site. Enjoy a little history tour in Oracle, Arizona of some gems and ancient buildings. In the Catalina Mountains, north of Tucson, Arizona, Southwest USA, with Flint Carter. For more information contact: Flint Carter, 520-289-4566. © 2005-2011 AzEntertain.com/irondoormine EMOL.org. / AZentertain.com / Entertainment Magazine. All rights reserved. 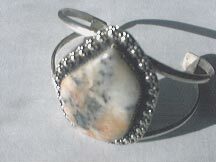 Cody Stone is mined and designed as jewelry grade gold and silver in quartz from the Old West. Cody stone specimens and hand made items are on display at the Oracle Inn Steakhouse & Saloon in Oracle, Arizona. Get a tour of the area, see artifacts of the Iron Door Mine and Southwest, and mine for gold with Flint Carter. The only source for Cody Stone. Call Flint at 520-289-4566. Mention the Iron Door web site. The story of the Iron Door Mine. Attempting to do for Westerns what his Guns of Navarone had done for World War II action epics, director J. Lee Thompson crafted Mackenna's Gold as a lavish, absurdly ambitious variation on Erich Von Stroheim's Greed, resulting in a last-gasp Western so eager to encompass the genre's traditions that it turns into a big, silly, wildly entertaining mess. --Jeff Shannon, Amazon.com. Printed book edition of Mackenna's Gold A Five-time Spur Award-winning Author. Somewhere in 100,000 square miles of wilderness was the fabled Lost Canyon of Gold. --This text refers to the Hardcover edition. Avon Books (Mm) (June 1988).